HÀ NỘI — Việt Nam expects to earn a total of US$9 billion from seafood exports this year, a year-on-year increase of 7 per cent, after achieving good results in the first nine months, according to the Việt Nam Association of Seafood Exporters and Producers (VASEP). With the current export growth and favourable factors from foreign markets, the country’s seafood exports in the fourth quarter of this year are expected to rake in higher export value than during the same period last year, when exports were worth $2.5 billion. Seafood exports have recovered from August until now, reaching growth of nearly 8 per cent to $847 million for the month of September. In the first nine months, the total seafood export value reached $6.42 billion, up 6.4 per cent over the same period last year. According to seafood export processing enterprises, the end of the third quarter is typically the time when enterprises increase their purchases of raw materials and increase the signing of export contracts for the holidays in the importing markets. They expected that demand for catfish will continue to increase in the last months of the year and shrimp prices will recover slightly after consecutive months of decline. Catfish exports have continued to be a strong point of the Vietnamese seafood industry this year, according to the association. Besides strong growth in catfish exports to the US, the export of this product to the EU was starting to increase gradually from June, after three consecutive years of reduction in exports due to fake news on this product in some European markets such as Spain and Italy. In the first eight months, the total value of catfish exports to the EU reached over $160 million, an increase of 15.4 per cent over the same period last year. This growth is expected to continue until the end of the year. Thanks to strong growth in export value from some big markets, the total export value of seafood product exceeded the forecast. Catfish exports in September continued to surge sharply by 45 per cent to $205 million, bringing the total export turnover in the past nine months to $1.6 billion, up 24 per cent over the same period last year. VASEP forecasts that catfish exports will continue to increase sharply in the last months of this year and will reach $2.1 billion, 22 per cent higher than that in 2017. Meanwhile, Việt Nam shrimp exports are expected to increase gradually in the last months of the year. However, as the supply of shrimp from major producers in the world is still large, the price of shrimp in the world will not increase. Some countries are selling at low prices to undercut the competition, creating negative pressure on the export price. Therefore, although the demand will increase in the last months of the year, Việt Nam’s export value of shrimp in 2018 is unlikely to grow strongly. It will likely remain at $3.8 billion, the same level as in 2017. The low growth of shrimp export value is dragging down the national seafood export value, making it hard to reach the target of $10 billion this year as planned, according to the association. Other export seafood products, such as tuna, squid, octopus and sea fish, are forecast to grow this year, reaching $650 million per product on average, an increase of 8 per cent over 2017. 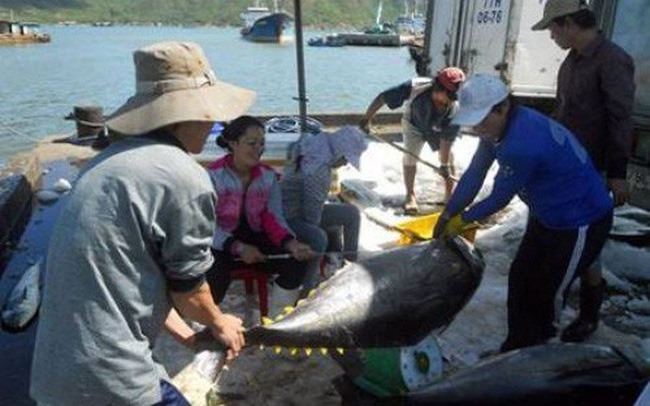 This is a good growth rate given that Việt Nam’s fishery sector has faced technical barriers and anti-dumping duties in several markets. It was also given a “yellow card” warning by the European Commission after the country failed to demonstrate sufficient progress in the fight against illegal, unreported and unregulated (IUU) fishing. However, Việt Nam’s aquatic products now have greater opportunities to enter the US market after a series of hurdles were removed. The Food Safety and Inspection Service (FSIS) under the US Department of Agriculture recently proposed that Việt Nam would receive a certification of its eligibility to export catfish and other fish products to the US market. VASEP Secretary General Trương Đình Hòe said the FSIS’s move would help improve Vietnamese catfish’s prestige and image in not only the US market but also other import markets across the globe. Recently, the US Department of Commerce (DoC) announced the final results of the 12th period of review (POR 12), lowering the anti-dumping tariff on shrimp imports from Vietnam. The POR 12 took place from February 1, 2016, to January 31, 2017. Previously, shrimp exported by Sao Ta Foods JSC (FIMEX VN), the only mandatory respondent in the review, and over 30 other local shrimp exporters were subject to an anti-dumping duty of 4.58 per cent. This final rate is much lower than the preliminary rate of 25.39 per cent, first announced by the DoC on March 8. It is also slightly lower than the duty was in the prior period. Trần Văn Linh, chairman of the Board of Directors of the Thuận Phước Seafood and Trading Corporation, said the high anti-dumping tariff is one of the reasons behind a decline in Vietnam’s shrimp exports to the US since 2017. The US’s imposition of a lower anti-dumping duty would facilitate Việt Nam’s shrimp exports to this market in the coming time, he said. The US is currently the third-largest import market of Vietnamese shrimps with an annual turnover of over $600 million, accounting for 17 per cent of the nation’s total shrimp export value. In mid-September, the DoC also reduced anti-dumping duties on Vietnamese catfish (tra and basa fish) under its preliminary conclusion of the 14th period of review (POR14) for the period from August 1, 2016, to July 31, 2017. Accordingly, the preliminary anti-dumping taxes on products of two mandatory respondents are zero per kilo and $1.37 per kilo. The DoC’s move to lower the anti-dumping tariffs is seen as a positive signal for Vietnamese catfish exporters, although the department is scheduled to announce the final results of POR14 in January 2019.